We are concerned about the well-being of Alberto and will be keeping you up to date on information from the incident here. This is DS Bjarne Riis description of the crash, ““Alberto crashed on a fast and straight part of the descent. He was reaching for his pocket and the bike was swept away under him probably because of a bump or hole in the road. Alberto was in the shape of his life and the entire team had our eyes fixed on the podium in Paris and the work we would have to do to get there”. Reports from Tinkoff-Saxo are saying the team car drove over the frame and Alberto was given a new bike but, after riding 18km further with a broken leg he had to abandon. Please check back here for the most up to date information. Initial reports on the Tour’s race radio, in French, and by NBC Sports’ Steve Porino, that Contador’s bike was “in pieces,” appear to be correct. “His frame snapped in half. They threw it in a heap in the back of the car,” Porino said, noting that he had arrived shortly after the crash. 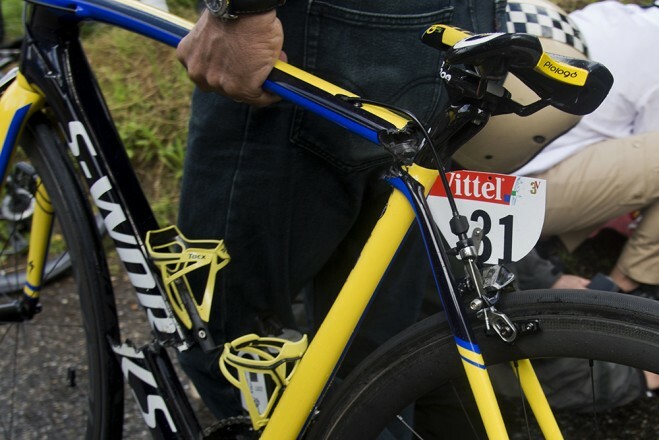 Contador’s bike broke in the lower third of his down tube and on the top tube just in front of his seat tube. Both tubes were broken clean through, with just a few fibers holding the two pieces of the frame together. As the story develops, note that bikes do break, and the number 31 Tarmac hasn’t made the Wikipedia list of conspiracy theories yet. Failures happen, as I’ve lamented in editorials, but not catastrophically, and from the photo, it looks like a bike that’s been doored (on a roof rack driven into a garage). But where it failed suggests a massive downward force, not a crushing/sideways force. It’s impossible to say from that one photo and if crushed under wheels, those areas would’ve been flattened. With so much speculation, we probably won’t get forensics, the CSI treatment, or autopsy. At this point of the Internet freakout, who’d believe it? And my guess that it looked “doored” is another version of the story from Cyclingtips who said that the racks of the Tinkoff Saxo got tangled with TeamBelkin’s car. However, where are the tears, cracking? This is clean, sheared break. A tweet of Contador’s bike, supporting the back-up bike, roof-rack version of events.